How Much Money Do I Need In Vietnam? How much money do you need to visit Vietnam? The answer ultimately depends on what kind of food you plan to eat, what standard of accommodation you plan to stay in, and how you plan to make your way around the country. Vietnam is one of Asia’s fastest growing countries, and as a result, the cost of visiting is going up every year. Despite this, it’s still possible to travel in Vietnam on a backpacker’s budget of $40 or less per day, or enjoy a more comfortable trip for $60 to $100 per day. For a five-star experience in Vietnam, it’s best to budget $200 or more per day – roughly the same amount as you’d spend in nearby countries like Thailand. Below, we’ve broken down the costs of travelling in Vietnam, from hotels to buses, flights and food. We’ve also covered factors like Vietnam’s currency and the availability of ATMs, credit card usage and the cost of visas and other travel documents. See also the Travelhappy Quick Guides to Vietnam’s major attractions. You can jump straight into finding out exact costs by checking Skyscanner for the cheapest flights to Vietnam (and within Vietnam); checking Booking.com for hotel prices from Hanoi to Ho Chi Minh City; and looking at 12Go for the cost and timetable of trains and buses in Vietnam. Otherwise, read on and see our specific recommendations on where to stay and what to do. Although Vietnam is getting more expensive every year, it’s still a cheap country to visit. Costs are comparable to Thailand and other nearby countries like Cambodia, although like with any country, certain things are either cheaper or more expensive in Vietnam than elsewhere. As a general rule, you’ll be able to travel around Vietnam as a backpack on a budget of $40 to $50 per day. However, your luxuries will be limited and you’ll spend more of your time eating at local restaurants instead of Western cafés and eateries. For a more comfortable backpacker experience in Vietnam, it’s best to budget around $50 per day. This way, you’ll have more money to spend on things like food, drinks, activities and hotel rooms. For a comfortable mid-range experience in Vietnam, it’s best to budget $60 to $100 per day for your entire costs. This gives you enough to pay for a comfortable three to four star hotel room, eat in mid-range to high-end restaurants and visit most activities and attractions. For a five-star experience in Vietnam, expect to pay $150 per day at the bare minimum (you’ll spend about $75-$100 for your hotel room, at the very least) or $200+ if you plan on dining out often and staying in a very luxurious hotel. Things To Do In Vietnam – How Much Do Activities Cost? 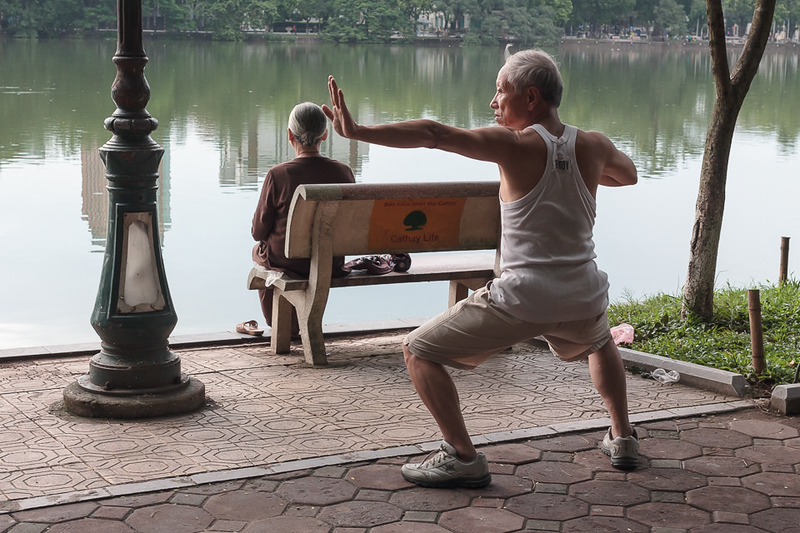 There are countless activity options for your time in Vietnam. Below is a small sample of popular tour and activities in and around Ho Chi Minh City and Hanoi – you can book all of these activities online with Klook, but you can also simply check them out for a sense of the price and then shop around when you arrive on the ground. Learn about Vietnam’s history and visit Reunification Palace and War Remnants Museum and Cu Chi Tunnels. Learn about the tunnels role during the Vietnam War and about life in the tunnels. 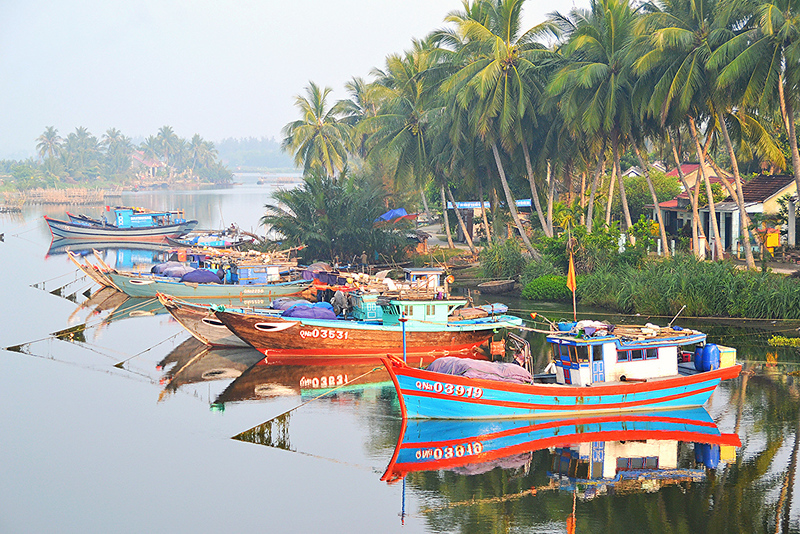 Southern Vietnams Mekong Delta is a stunning maze of rivers, islets, Khmer pagodas, floating markets and small villages with rice paddies. This 9 hour tour is a visual buffet of delights. Take in 360-degree views of the city from the tallest building. 4 hour urban scooter adventure to explore Saigon’s diverse districts and markets. This enchanting art form tells folk tales and legends, it’s authentic, creative and visually stunning. Learn how to make Vietnamese food, visit a market for ingredients and dine on your creations. Try a myriad of local delicacies, from the French-influenced Vietnamese banh mi and Bun Cha noodles to sweet milk dessert, fruity drinks, and egg coffee. Tour the backstreets and local markets to sample some of the best local food under the guidance of a resident foodie. Discover delicious mouth-watering street food from family-run stalls and restaurants. Learn how to recreate Vietnamese dished with an experienced chef. Includes market visit and take home recipes. Sample the culture, architecture, history, and traditions in this packed one-day experience. Enjoy the scenery of Trang An, join a boat cruise to explore the caves and visit the largest pagoda in Vietnam. Enjoy beautiful Halong Bay, this unique location is a UNESCO World Natural Heritage Site and a stunning area not to be missed. 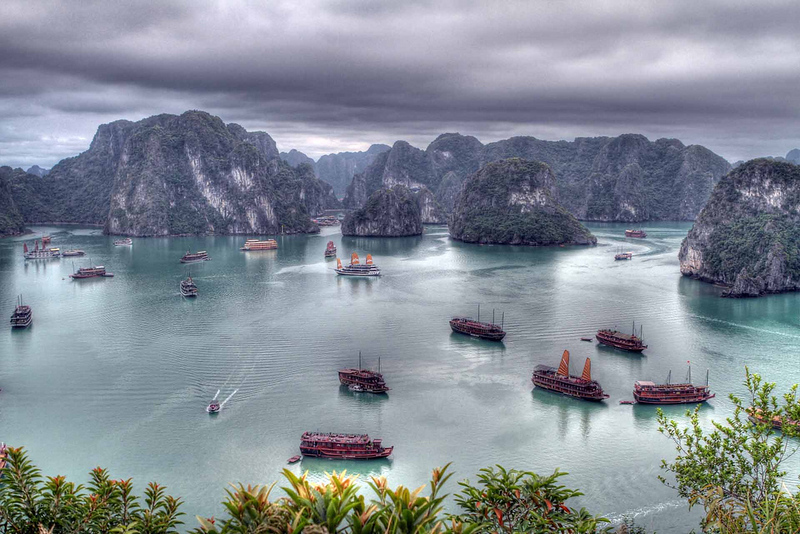 Enjoy Halong Bay’s epic scenery on a day trip from Hanoi. Visit Vietnam’s ancient capital and enjoy the scenery and diverse landscapes along the Tam Coc River. Immerse yourself in Vietnams stunning countryside, see village life and include a hotel or homestay. While not paying for travel insurance may seem a way to save money, if something unexpected happens in Vietnam it will cost you a lot of money for medical help or replacing lost luggage, missed flights and so on. Make sure you’re covered for every eventuality by buying travel insurance. World Nomads is one of the leading travel insurance providers, recommended by both Lonely Planet and National Geographic. Make sure you’re covered before you travel to avoid having to pay large sums for medical care, lost items, missed flights and other travel annoyances. One of the easiest ways to save money in Vietnam is to eat local food. Vietnamese food is tasty, affordable and — provided you avoid the deep fried dishes — substantially healthier than most of the alternative options you’ll find in cafés and Western restaurants. For the most part, street food stands and small restaurants in Vietnam are clean, sanitary and completely safe. They’re also amazingly cheap, with snacks and small dishes available from as little as 10,000 dong a piece. 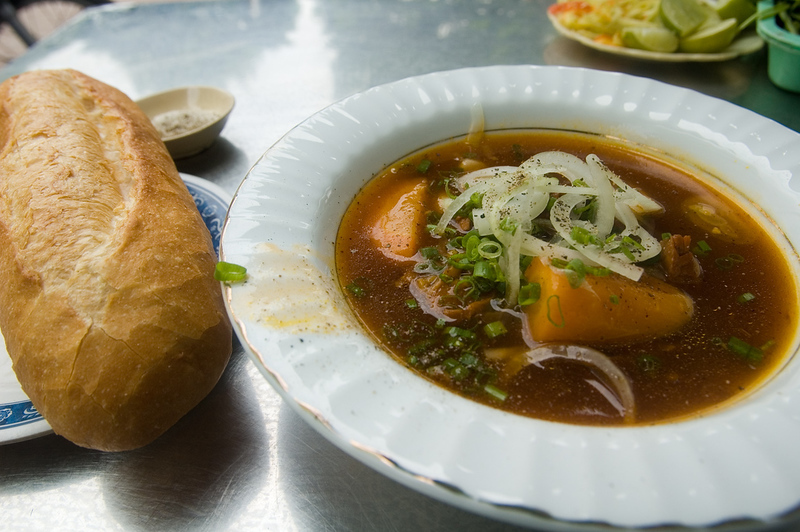 Some of the most popular Vietnamese dishes include pho (noodle soup), which is available for 15,000 to 50,000, depending on the ingredients, and makes a great simple breakfast. Bánh mì, which are meat and pickled vegetable sandwiches, can also be found for 10,000 to 35,000. Because of Vietnam’s import taxes, some Western restaurants will be priced equally or higher than they would be in Western countries. Expect to pay 100,000-150,000 for dishes like pizza, Indian curry, spaghetti and other simple dishes and 400,000+ for steak, usually imported from Australia or New Zealand. If you like street food, expect to spend $10 to $15 per day for your meals. If you prefer to eat in air conditioned restaurants, it’s best to budget $15 to $30, or more if you plan to eat expensive, imported items like steak and certain seafood dishes. 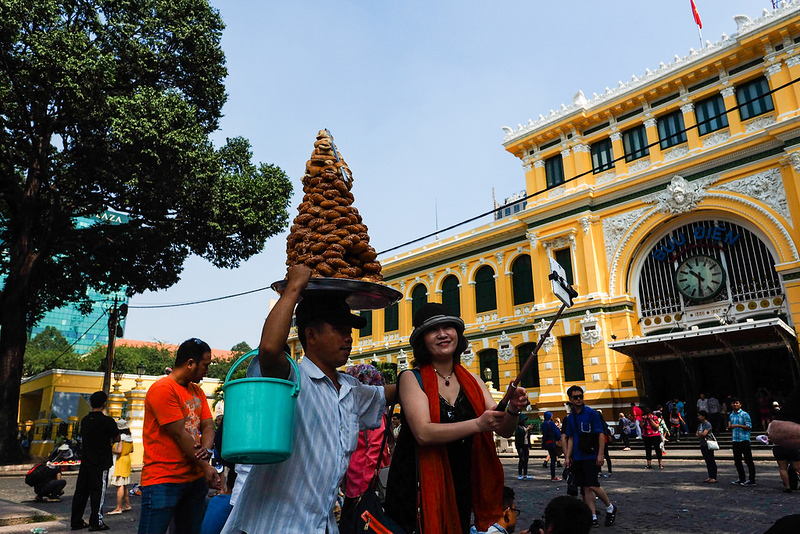 Like all countries, food costs can range from cheap to incredibly expensive in Vietnam. If you’re fond of dining in hotels and high-end restaurants and have a taste for nice wine, it’s completely possible to spend $200 or more on a meal for two in a high-end restaurant in Hanoi or Saigon. Banh Mi Huynh Hoa: Popular bánh mì outlet close to Ben Thanh Market, with some of the best sandwiches you’ll find in Ho Chi Minh City. Prices are fixed at 35,000 dong as of February 2017, which is more expensive than other bánh mì shops but worth it for the quality ingredients. Pho Le: One of Ho Chi Minh City’s most popular pho shops, famous for strongly seasoned pho and its somewhat cramped interior. Like Banh Mi Huynh Hoa, Pho Le is slightly more expensive than other pho restaurants but is famous among locals and visitors alike for its quality. Bookworm’s Coffee: Coffee shop and restaurant in Pham Ngu Lao, close to the backpacker district. A great option for strong coffee, tea, burgers and vegetarian food. The Workshop: One of many high-end cafés to have opened in Ho Chi Minh City over the last few years, The Workshop serves cold brew coffee, espresso and other favourites in a top-floor location overlooking Dong Khoi Street. Mandarine Restaurant Saigon: High-end Vietnamese dining in a beautiful historic building. A great option if you’d like to explore Vietnamese food beyond what’s available on the streets and in the shopping malls. La Villa French Restaurant: One of many French restaurants in Ho Chi Minh City, La Villa is a great choice if you’re seeking a break from Vietnamese food and want a rich French dinner with great wines and desserts. The Deck Saigon: An excellent bar and restaurant, The Deck Saigon is located on the bank of the Saigon River in Ho Chi Minh City’s District 2. One of the best places to relax and escape the hustle and bustle of Saigon. Banh Mi 25: Located a short walk from Hoan Kiem, Banh Mi 25 sells great sandwiches priced from 25,000 dong. A great place to enjoy a cup of fresh coffee and a filling sandwich before starting your day. S’Patisserie: A nice café and eatery located on the southern edge of Hoan Kiem, S’Patisserie is a great place to enjoy strong coffee and rich, tasty French desserts. Also served a good variety of European lunch dishes. Pho Thin: One of Hanoi’s most popular pho restaurants, Pho Thin serves excellent Vietnamese noodle soup for around 50,000 dong. It’s best to arrive a few minutes before you plan to eat, as this restaurant is always crowded with both visitors and locals alike. Spices Garden: High-end Vietnamese dining in a beautiful colonial setting, with a diverse menu covering most areas of Vietnam. Located inside the Sofitel Legend Metropole Hanoi. La Badiane: Excellent French-inspired restaurant with indoor and courtyard dining areas. Prices are on the high side for Vietnam but very reasonable compared to similar restaurants in Western countries. Jacksons Steakhouse: Small, charming steakhouse serving up American, Australian and New Zealand beef. Also has a great cocktail and dessert menu. 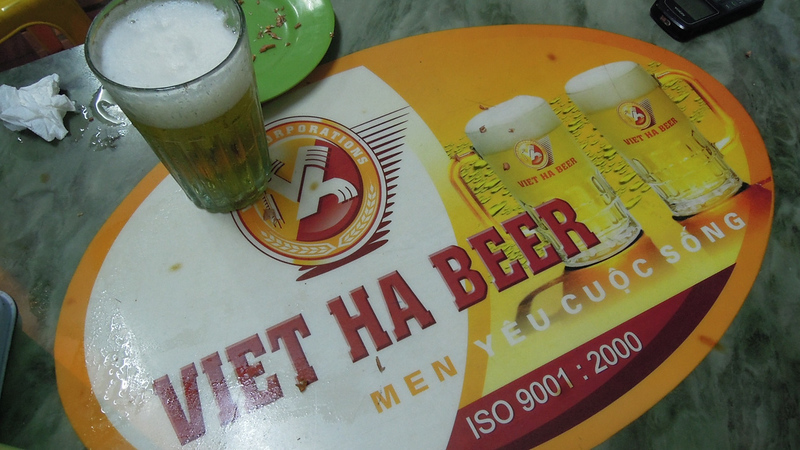 Alcohol is very affordable in Vietnam, with bia hoi (locally brewed beer served on tap) available from as little as 5,000 dong in local restaurants and backpacker hangouts. Craft beer is available in Vietnam at many Western restaurants, and at brewery bars such as the Pasteur Street Brewing Company in Ho Chi Minh City. Wine is somewhat expensive in Vietnam when compared to most Western countries, although not exorbitantly so. Spirits in Vietnam are fairly cheap, with local moonshine available for less than 20,000 dong per bottle and most imported spirits available for 50,000 to 150,000 per glass in bars. As always, it’s possible to drink cheaply or spend a fortune on alcohol in Vietnam, depending on your tastes. Cigarettes in Vietnam are extremely cheap, with local cigarettes available from 15,000 dong and imported cigarettes available for 20,000 to 30,000 per pack. In short, even if you’re a very heavy smoker, you’ll spend very little on cigarettes in Vietnam. There are three main ways to travel around Vietnam – airplane, train and buses. You look up the cost and buy tickets for each route you want to travel (e.g. Hanoi to Ho Chi Minh City) on 12Go – this site lets you compare the prices and time of journey between planes, trains and buses in Vietnam so you can decide when to go slow and cheap or spend some extra cash and get there quickly. Vietjet, a Vietnamese low-cost airline that offers ultra-budget flights between cities in Vietnam and international destinations such as Bangkok and Hong Kong. Jetstar, an international low-cost airline that offers flights between most cities and major tourist destinations in Vietnam. 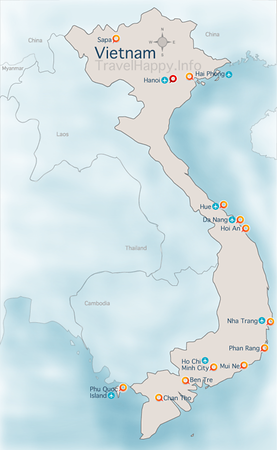 The cost of domestic flights in Vietnam varies based on the season. It also varies based on how early ahead of time you book your flights. Book weeks in advance and you can fly from Ho Chi Minh City to a destination like Da Nang for under 700,000 dong (about $30 USD). Book at the last minute, especially during high season, and you could spend two million dong or more. If your budget permits, we recommend flying around Vietnam instead of travelling by train or bus. Traffic in Vietnam is extremely noisy and chaotic, and even a short bus trip can end up taking several hours due to road congestion, accidents and interruptions. Buses are by far the cheapest way to get around Vietnam. However, the country’s crowded road network means that even short trips of 100 miles or less can take the better part of a day due to interruptions and traffic. You’ll also have to deal with noise when you travel by bus, both from other vehicles and from the ubiquitous karaoke machines installed on Vietnamese buses, including overnight ones. If you’re tolerant of noise, however, travelling Vietnam by bus can be pleasant and very affordable. The best way to travel around Vietnam by bus is to buy tickets for the specific legs you need to cover a day or two in advance. Bus tickets are available from travel agencies in all major cities and tourist destinations, such as Hoi An, Hue and Da Nang. Bus tickets generally cost approximately 50,000 dong per hour of travel time. You’ll pay slightly more for VIP buses (which are worth getting, especially if you like a comfortable trip) but should be able to travel inexpensively at 150,000 to 500,000 dong for most eight to 10 hour bus trips. For example, a ticket on a SinhTourist bus between Ho Chi Minh City and Nha Trang costs just over 160,000 dong ($7 USD) and takes 10 hours, with free Wi-Fi provided on board. 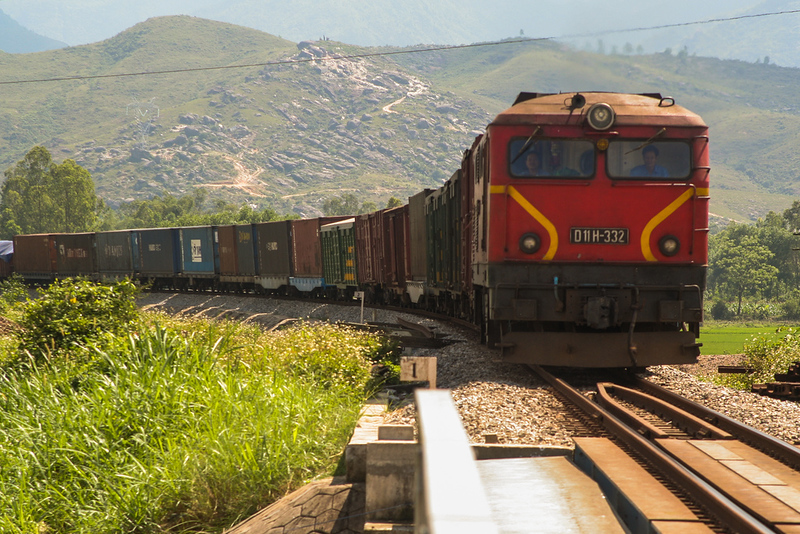 Vietnam’s train network is a little rough around the edges but offers a great way to travel around the country cheaply. Travelling by train costs about the same as travelling by bus but offers the peace and quiet that’s hard to find on Vietnam’s highways. Travelling by train in Vietnam is best for long, overnight journeys that give you plenty of time to rest and relax. Soft sleeper tickets, which provide a bunk in a small room with enough space for four people, offer the best mix of comfort and value for money. Vietnam’s national currency is the Vietnamese dong (VND). Thanks to its high denomination (one US dollar is worth about 22,700 dong, as of February 2017), it can be quite a confusing currency to adjust to as a visitor. The dong has steadily decreased in value compared to most Western currencies over the past few years, so it’s best to check the current exchange rate before you start your trip. Be wary of articles that are more than two to three years old, as they often provide outdated information. Vietnamese banknotes range in value from 500 to 500,000 dong. All Vietnamese banknotes have a similar design, with a smiling portrait of Ho Chi Minh and the note’s value printed in a bold, obvious font. Despite the huge font, it can be easy to get Vietnamese banknotes mixed up. Before you pull out your money to pay for anything, be aware that the 20,000 dong and 500,000 dont notes — one worth less than a dollar and the other more than $20 — have an almost identical colour. This is also true of the 50,000 and 200,000 dong notes, which are both printed on red plastic paper. Double-check that you have the right note before you pay for anything, as merchants have been known to “forget” to give change in this situation in the past. Vietnam doesn’t have any coins, meaning you’ll amass a large collection of banknotes (usually low-value, somewhat useless notes like 500 and 1,000 dong) over the course of your stay. It’s best to keep these in your backpack and use them all at once to buy cheap, simple items. Although Vietnam used to use the US dollar as an unofficial second currency, as of 2017 almost all transactions are made using Vietnamese dong. The only transactions made using US dollars are for visa processing fees, which you’ll need to pay if you plan to get a visa on arrival. You can convert almost all major currencies into Vietnamese dong in any of Vietnam’s major cities and tourist destinations. Visitors from most Western countries will need a visa to enter Vietnam. Some citizens of European countries can enter Vietnam without a visa for up to 15 days – see this separate page about Vietnam visas for more details. AS of February 2017, Vietnam now allows you to apply for a visa online through an official government website. You upload your documents, pay your fee and once it’s approved, you print out your visa to show the immigration official when you arrive in Vietnam. Note that this is NOT the same as the numerous agencies that offer Vietnam visa on arrival services. Prices for visa on arrival approval letters vary based on how urgently you need to file your visa application and how long you plan to stay in Vietnam. For a one month, single entry tourist visa, expect to pay $18 to $30 for service within one working day. Once you receive your visa approval letter, you can pick up your visa on arrival before passing through immigration at any Vietnamese international airport. Not that you’ll also need to pay a stamping fee of $25 USD per person for single entry or $50 for a multiple entry visa. You can avoid the lines at immigration by applying for your visa outside of Vietnam. Our guide to getting a Vietnamese visa in Bangkok covers the entire application process for people based in Thailand looking to travel to Vietnam. Just a few years ago, ATMs were fairly rare in Vietnam outside of business districts and tourist areas. Today, ATMs from both Vietnamese and international banks are very easy to find in any Vietnamese city and offer competitive fees for withdrawing Vietnamese dong. If your ATM card uses the Visa, Mastercard or Cirrus networks, you’ll be able to withdraw cash from almost all Vietnamese ATMs without issues. Fees range from 40,000 to 66,000 dong for each withdrawal, depending on the specific bank. To keep your ATM fees down, it’s worth withdrawing several million dong at once. Some ATMs, particularly ATMS operated by Vietnamese domestic banks, have a limit of two million dong per withdrawal. You can avoid these limits by withdrawing cash from CitiBank or ANZ machines. Credit cards are accepted by most modern businesses, hotels and chains in Ho Chi Minh City and Hanoi. However, if you’re visiting a small city or off-the-beaten-track destination, it’s always best to carry enough cash to cover your expenses without having to use a credit card. Because Vietnamese dong is not a major regional currency, it can be hard to exchange outside of Vietnam. If you have dong leftover at the end of your trip, it’s best to exchange it at the airport into a currency you can use in your next country. Accommodation in Vietnam ranges from ultra-budget rooms in family-owned guesthouses to some of Southeast Asia’s most luxurious hotels. Over the last 10 years, Vietnam has grown at an incredible pace, with new hotels opening throughout the country every few months. In major cities like Ho Chi Minh City and Hanoi, you’ll be able to choose from a huge selection of hotels in all price ranges. In smaller destinations, you’ll find a good mix of budget and mid-range accommodation options at very reasonable prices. Located on Bui Vien — Ho Chi Minh City’s version of Bangkok’s Khao San Road — the Beautiful Saigon 3 Hotel is an inexpensive hotel that over delivers in terms of comfort and facilities, with a large outdoor pool and clean, spacious rooms. One of the best budget options in Saigon. Another Bui Vien option, Duc Vuong Hotel is a cosy and clean three-star hotel with a variety of rooms and suites priced with budget travellers in mind. One advantage of this hotel (as well as Beautiful Saigon 3 Hotel above) is that it’s within walking distance of several museums. Located close to Benh Thanh Market, Cititel Boutique Ben Thanh Hotel is a modern three-star hotel with clean and comfortable rooms, a good restaurant and a great location in the heart of District 1. Located close to the Independence Palace and a short walk from Dong Khoi, Silverland Yen Hotel is a great four star hotel with modern rooms and great facilities, including a rooftop pool, fitness centre and more. One of the best mid-range options in the Ben Thanh area. Located on Le Thanh Ton street, the Avanti Hotel is a great three-star hotel that’s a short walk away from the Independence Palace, People’s Committee Building, War Remnants Museum and other popular sights. A great option if you want to get around Ho Chi Minh City on foot. Millennium Boutique Hotel is a new four-star hotel located no Thai Van Lung Street, close to Ho Chi Minh City’s Japanese district. With a great location close to shopping and attractions, clean and comfortable rooms and a rooftop pool, this is one of the best mid-range hotels in the area. Located on Pasteur Street, Liberty Central Saigon Citypoint Hotel is a four star luxury hotel that sits close to the War Remnants Museum, Independence Palace and other sights. Rooms here are clean, modern, comfortable and fairly priced for a high-end hotel. The Rex Hotel famously served as a base of operations for the US military leadership during the war. Today, it’s one of Ho Chi Minh City’s oldest hotels and a great option for anyone that prefers a classic, grand old hotel to the modern buildings that are popping up all over Ho Chi Minh City. One of Asia’s most luxurious hotels, The Reverie Saigon is as close as Vietnam gets to six-star luxury. Rooms here are extremely lavish and comparable to the top hotels in major world cities like New York and London, both in quality and in price. Like most budget hotels in Hanoi, Hanoi Serenity Hotel 2 is located in the city’s Old Quarter. A short walk from sights like the Temple of the Jade Mountain, this is a simple and pleasant three star hotel with clean rooms and a convenient location. Spring Flower Hotel is a small budget hotel a short distance from Hoan Kiem lake and several of Hanoi’s top sights. Rooms are comfortable and clean, with a variety of good cafés and eateries a short walk away. Another Old Quarter accommodation option, Hanoi Romance Hotel is a small three-star hotel with modern rooms and a convenient location. Located on a small laneway, this hotel offers a little more peace and quiet than most hotels in the Old Quarter. Hanoi La Siesta Hotel Trendy is a modern four-star hotel located in the heart of Hanoi’s Old Quarter, a short walk from Hoan Kiem and attractions like the Temple of the Jade Mountain. Rooms here are clean and modern, with free Wi-Fi and friendly, helpful staff. Another option close to Hanoi’s Old Quarter, May De Ville Old Quarter Hotel is located just north of Hoan Kiem Lake. Rooms here are clean and comfortable, with plenty of natural light and, for some rooms, good views over the Old Quarter and surrounding area. Located across Hoan Kiem Lake, Thang Long Opera Hotel Hanoi is conveniently situated close to many of Hanoi’s top attractions but doesn’t have the noise or bustle of hotels located right in the Old Quarter. Rooms here are clean, spacious and elegantly decorated. Apricot Hotel is a neo-classical luxury hotel with excellent views of Hoan Kiem Lake. Rooms and suites here are spacious and very nicely decorated, with lots of natural light and plenty of space for you to stretch out and relax. This hotel also has a rooftop pool with spectacular views. Located right beside Hanoi’s West Lake, the Pan Pacific Hanoi is a modern five-star hotel with a spectacular view of Hanoi’s largest lake. Rooms are spacious and comfortable, offering exactly what you’d expect from an international five-star hotel. Fraser Suites Hanoi is located a short distance from the West Lake, making it a great option for exploring Hanoi’s CBD and largest recreational area. This is a modern, high-end hotel with large and luxurious rooms and facilities like a gym and outdoor swimming pool. Located close to Hoi An’s Old Town, Pho Hoi Riverside Resort is an affordable resort with large rooms, villas and bungalows. It also has a relaxing riverside location and outdoor pool, making it one of the best budget resorts you’ll find in Hoi An. One of Hoi An’s highest rated budget hotels, Nova Villa Hoi An is conveniently located close to the historic Old Town. Beautiful river views, cosy rooms and an outdoor pool make this one of the best affordable hotels in Hoi An. Hoi An Silk Boutique Hotel and Spa is a modern four-star hotel located close to the centre of Hoi An. Clean, modern rooms and great facilities such as its calm outdoor swimming pool make this a great option near Hoi An’s main sights. Hoi An River Town Hotel offers large, comfortable rooms with balconies that offer a panoramic view of the Thu Bon River. A short distance from the Old Town, this is a peaceful and luxurious hotel that offers excellent value for money. Hoi An Historic Hotel is a beautiful colonial hotel located close to Hoi An’s Old Town. Rooms and suites are spacious, comfortable and elegantly furnished, with facilities including a large outdoor swimming pool, fitness centre, kid’s play room, beauty salon and spa. Another colonial hotel, Hotel Royal Hoi An MGallery combines modern rooms with a grand old hotel atmosphere. Rooms here are spacious and comfortable, with a great outdoor pool and a short walk from the hotel to nearby attractions like the Japanese Bridge and Hoi An Old Town.